Join Life Force and international yogis, Lindsay Gonzalez and Melody Massey, as they lead you on a journey of discovery through yoga, meditation and more, while cruising from Flores through Komodo National Park to Bali. Quench your wanderlust and inspire your innermost self on a beautiful ‘pinisi’ schooner, with delicious meals, delightful company, enchanting nature, and daily yoga and mindfulness practices. Surrounded by the captivating turquoise waters of the Komodo National Park we will engage your inner explorer through land and sea adventures, highlighted by a trip to see Komodo dragons and myriad other land and sea creatures up close and in the wild. Days will be spent integrating the physical, emotional, and spiritual elements of your yoga practice with a variety of adventures and downtime to achieve your ideal balance of activity, play, exploration, and relaxation. Each day, yoga, meditation, or mantra chanting will take place on the deck, on the beach, on a hill or on a SUP board, with two sessions daily at sunrise and sunset. Through this invigorating yoga program and immersive nature-focused adventure we will journey together to discover our individual and collective peaceful balance. Lindsay Gonzalez, ERYT-500, is an international yoga teacher in search of adventures on and off the mat. She is known for her keen understanding of breath work practices, body alignment, sense of humor, and ability to empower her students to live fully! With over a decade of experience in her field, she leads 200- and 300-hour teacher trainings, workshops, and retreats throughout the world. Lindsay is a writer of continuing education programs for yoga teachers and is releasing her first book in 2017. 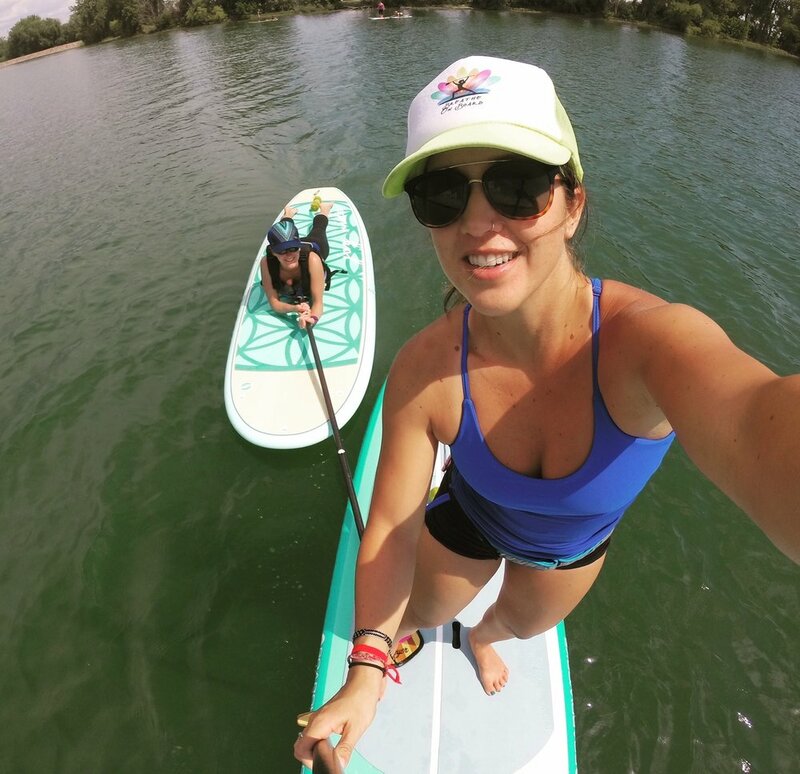 She is passionate about teaching yoga alignment, world travel, stand up paddle boarding, and SUP yoga. Follow Lindsay on Instagram at @Breatheonboard for inspiration and upcoming workshops, retreats, and trainings. Melody is a certified Hatha yoga instructor, singer, writer, and world traveler. While living in India, her casual yoga practice became a passion that inspired her to become a yoga teacher. Her classes range from gentle yoga and Vinyasa to Bhakti yoga, a heart-opening practice weaving storytelling with mantras, music, and asana. Melody teaches private, group, and virtual yoga classes, hosts yoga retreats and workshops, and offers live music for yoga classes. She is lead singer of Oneness, a mantra rock band with shades of blues, jazz, roots and gospel, merging ancient chants with original and sampled lyrics to create an uplifting, interactive experience with the audience. Connect with Melody at: melodymassey.com. This is an all-levels yoga and travel experience geared towards anyone who wants to take their yoga practice out of the studio and into a spectacular natural environment, surrounded by enchanting turquoise waters of the Komodo National Park. Each day we will engage in morning and evening sessions of yoga, meditation, or mantra chanting to expand your existing practice, or, if you are new to yoga, to immerse yourself into a dedicated daily practice routine. After flying from Bali in the morning or early afternoon, you will be transported to a beachside resort just outside of the port town of Labuan Bajo, the gateway to Komodo National Park. There will be time to relax and unwind with a swim or a snorkel, or even a walk around the town. Its also an opportunity for those unfamiliar with snorkeling to have a lesson with our ship's tour leader. In the late afternoon, Lindsay will offer an optional introductory/refresher stand up paddle boarding session followed by our first yoga practice on the beach. In the evening, we will enjoy sunset drinks on the beach before dinner with fellow Life Force guests as you get better acquainted for the voyage ahead. In this savannah-like setting of dry, rugged landscape, we will encounter Komodo Dragons, at a safe distance. These awe-inspiring, giant lizards –Indonesia's living dinosaurs. We may spot deer, wild boar, sulphur-crested cockatoos, butterflies, rare orchids, and jungle chickens among the strangle-fig trees and the distinctive lontar palms. We will head to Makassar Reef, where we will look for manta rays. If we are lucky enough to spot them, we will snorkel with these gentle giants. With over 1,000 species of fish in the waters of the national park, there is much more to this wildlife reserve than the dragons. We will walk to the top of one of the island's hills where the horizon opens up to an iconic vista overlooking all 80 islands within the Komodo Archipelago and the island of Flores. Ombak Putih, our beautiful floating home for seven days is an atmosphere of pure enjoyment, with good food, top class service, and great company ideal for an awe-inspiring adventure. Whilst on board, guests are immersed in a world of barefoot bliss with access to air-conditioned private en-suite cabins, indoor and outdoor social hubs, dining areas, and a sun deck. The wonderful crew of our home away from home will work hand in hand with Life Force leaders to ensure an enjoyable and safe venture throughout the island adventure. Their smiles and friendly personalities offer an even greater insight into the Indonesian way of life. The professional, friendly crew and multilingual tour guides will assist in all activities both on land and at sea, answer any questions, provide in-depth daily briefings, and ensure the smooth running of our journey. SeaTrek, our Bali-based partner for the Life Force Wellness Cruise, is the premier adventure sailing operator in the Indonesian archipelago, with over 25 years of experience showing guests the distinctive beauty and charm of Indonesia's exotic islands. Our talented chef and culinary staff will prepare nutritious meals, snacks, and fresh juices daily, taking pride in conjuring up all manner of dishes and delicacies from across the world, using only the best quality meat, seafood and fresh produce available – with the latter often sourced from local markets and the fisherman we meet along the way. Vegetarian dishes are a specialty, and most special dietary requirements can be accommodated easily. Colorful and plentiful dishes will keep our team energized and centered throughout our exotic adventure. Our Idonesian cruise begins in Flores and ends in Bali. As there are no direct flights from international destinations to Labuan Bajo, Flores, Life Force suggests flying in and out of Denpasar, Bali (arriving no later than June 16th) and scheduling a separate domestic flight to Flores at the start of our journey. With a limited number of flights per day from Denpasar, Bali to Labuan Bajo, Flores, we suggest you book your one-way domestic flight as early as possible before flights fill and rates increase. It is highly recommended that you fly on Garuda Airlines (garuda-indonesia.com) from Denpasar to Labuan Bajo – it is the most reliable airline. The most ideal flights would be either of the two morning Garuda flights on June 17, 2018, 7:30 a.m. - 9:05 a.m. or 10:55 am -12:25 pm. A valid passport is required for all foreign visitors to Bali. A passport with a minimum of two blank pages valid for at least six months beyond your arrival date is required. You must also have a return or onward ticket to another country. U.S. citizens, and citizens of 168 other countries, can receive a no-fee Tourist Visa Exemption stamp upon arrival for stays of 30 days or less. In preparation for your trip, please read our Travel Planning Guide for important tips and information.